The fabulous gown, the multitiered cake, abundant flowers, attendants and guests in their finery. The white wedding does more than mark a life passage. It marries two of the most sacred tenets of American culture—romantic love and excessive consumption. For anyone who has ever wondered about the meanings behind a white dress, a diamond ring, rice, and traditions such as cake cutting, bouquet tossing, and honeymooning, this book offers an entertaining and enlightening look at the historical, social, and psychological strains that come together to make the lavish wedding the most important cultural ritual in contemporary consumer culture. With an emphasis on North American society, Cele C. Otnes and Elizabeth H. Pleck show how the elaborate wedding means far more than a mere triumph for the bridal industry. 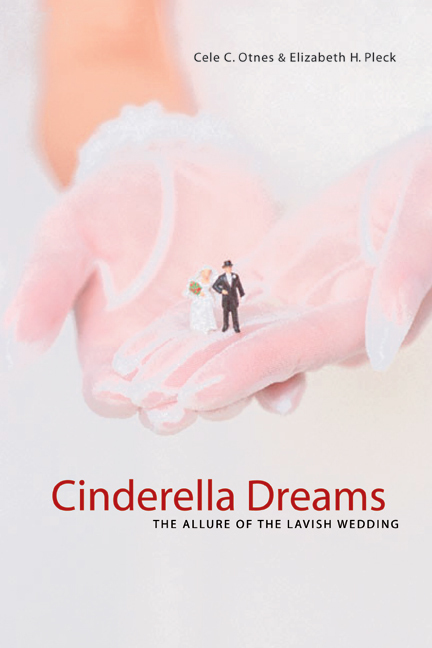 Through interviews, media accounts, and wide-ranging research and analysis, they expose the wedding's reflection—or reproduction—of fundamental aspects of popular consumer culture: its link with romantic love, its promise of magical transformation, its engendering of memories, and its legitimization of consumption as an expression of perfection. As meaningful as any prospective bride might wish, the lavish wedding emerges here as a lens that at once reveals, magnifies, and reveres some of the dearest wishes and darkest impulses at the heart of our culture. Cele C. Otnes is Associate Professor of Business Administration at the University of Illinois, Urbana-Champaign. She is the coeditor, with Richard F. Beltramini, of Gift-Giving: An Interdisciplinary Anthology (1996), and is also coeditor, with Tina M. Lowrey, of the forthcoming book Contemporary Consumption Rituals: A Research Anthology (2003). Elizabeth H. Pleck is Professor of History and of Human and Community Development at the University of Illinois, Urbana-Champaign. She is the author of Celebrating the Family: Ritual, Consumer Culture and Ethnicity (2000) and Domestic Tyranny: The Making of Social Policy against Family Violence from Colonial Times to the Present (1987).